When it’s time to “Run for the Roses,” The Brown Hotel is Louisville’s most glamorous spot for Derby Day gatherings, welcoming a nearly endless parade of celebrities and socialites reveling in the pomp and pageantry of Louisville’s most iconic event. Often called the “most exciting two minutes in sports” for its approximate length, this beloved horse race dates back to May 17, 1875, when Meriwether Lewis Clark, Jr., grandson of William Clark of the Lewis and Clark Expedition, and grandnephew of the city’s founder, George Rogers Clark, spearheaded the first race. The “Mint Julep,” an ice-cold mix of bourbon, mint, and sugar, is the traditional drink of the race. “Millionaire’s Row,” a reference to the box seats that attract the rich and famous. Over the years, the Kentucky Derby captured the imagination of celebrities around the world. This star-studded assemblage of fashionably dressed spectators adds a unique dimension to the race. The Kentucky Derby is often referred to as the “Run for the Roses” because a lush blanket of 554 red roses is awarded to the winner each year. 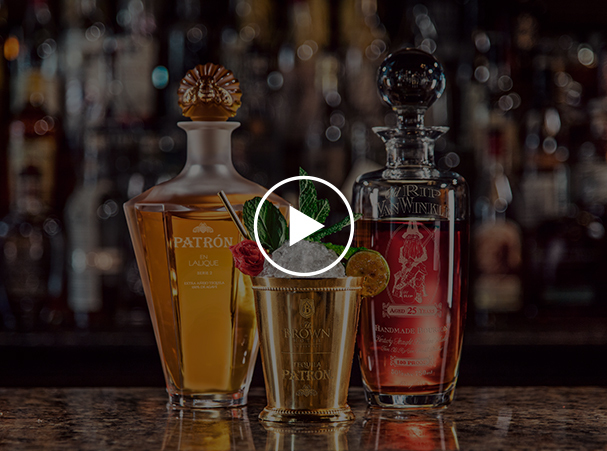 The Brown Hotel’s world-famous Derby parties were elevated even higher this year with our new, specially crafted cocktail, the Patrón Agave Julep. Featuring two ultra-premium liquors, Patrón en Lalique: Series 2 and Old Rip Van Winkle 25-year-old bourbon, this $1,500 cocktail is making headlines. Even Dylan Dreyor, host of The Today Show, stopped by to report on our most deluxe drink yet.